Rob Baker finished with 12 points in Friday night's victory over Yale off of four triples. “Airball, airball,” was the raucous serenade of the student section, packed to standing room capacity, as a three-pointer from Yale junior forward Jordan Bruner fell well short and wide of the basket. 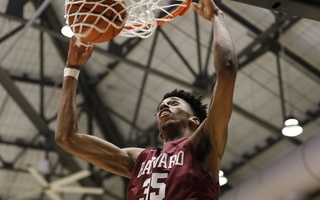 The crowd — loudly involved from the opening tip — spurred the Harvard men’s basketball team to a commanding, wire-to-wire 65-49 victory over its rivals from New Haven, in front of a sold-out Lavietes Pavilion and nationally televised contest on ESPNU. Despite the presence of Danny Ainge — the President of Basketball Operations for the Boston Celtics, seven other Celtics front office staff, and various other NBA scouts, a focused Crimson team extended its win streak over the Bulldogs (12-4, 2-1 Ivy) to three games. 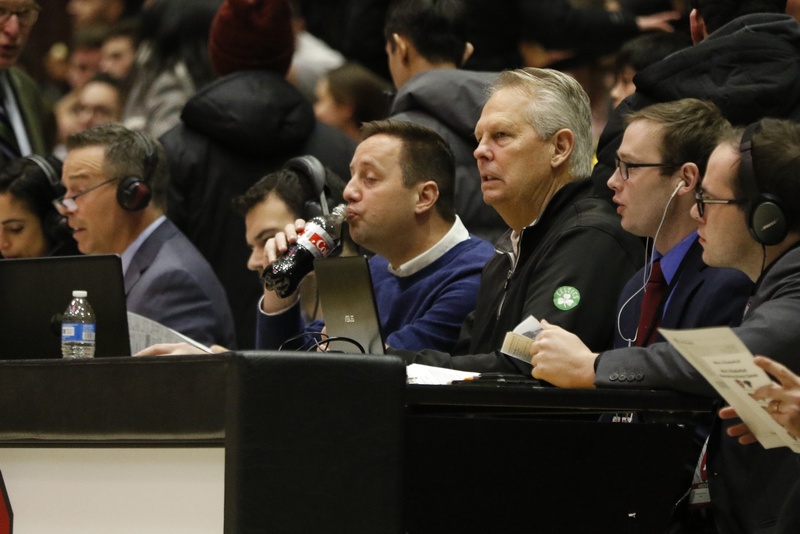 The Boston Celtics sent their top brass to Lavietes Pavilion on Friday night, including President of Basketball Operations Danny Ainge. Harvard (9-7, 2-1) was the first team to hold Yale to fewer than 50 points, and limited the visitors to a paltry 20-point first half, a more impressive defensive performance against the Bulldogs than even that of No. 2 Duke at Cameron Indoor Stadium. Yale was able to muster 32 points in the first half against the Blue Devils, and a previously season-low 29 at Monmouth. The Bulldogs were unable to penetrate the hosts’ perimeter defense, and ultimately fell before traveling on to Hanover late Friday night. 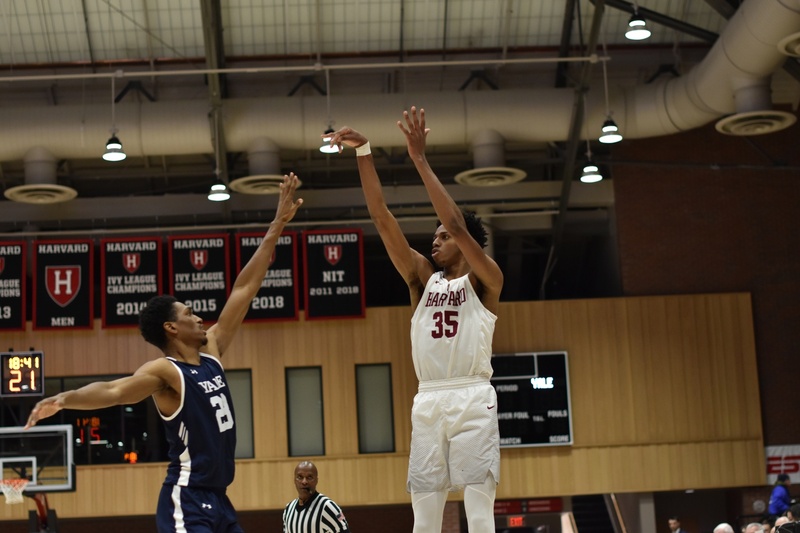 An impressive team-leading 13-point performance from junior Robert Baker was amongst the standout individual efforts Friday night, as the Crimson relied heavily upon team defense to neutralize Yale standout Miye Oni, to secure victory at home. The Woodstock, Ga., native finished a point shy of a career-high he set in a victory over Saint Joseph’s last season, and knocked down 4-of-5 shots from beyond the arc. Baker, whose flashes of brilliance have begun to appear with increasing frequency was quick to deflect credit to his teammates. A three-pointer from junior wing Justin Bassey, who tied Baker’s mark of 13 points, gave Harvard a lead 13 seconds into the game - which the hosts would never relinquish. Bassey’s most important contributions, however, came on the defensive side of the ball. The Denver, Colo., native was responsible for the unenviable task of shadowing Oni for 30 minutes. Oni, a potential NBA draft pick likely responsible for the attendance of Ainge and other NBA personnel, was frustrated throughout Friday night’s contest by Bassey’s unrelenting defense. The Northridge, Calif., native finished with 11 points on a paltry 3-of-15 from the field, including a pedestrian 0-for-6 from three-point territory. In an Ivy League season characterized thus far by unexpected results and injuries to key players, Friday night’s steady performance was a welcome change for the Crimson, on the first night of the full Ivy League schedule. While defending league champions Penn fell to 0-3 in conference play with a tight loss at Cornell, Harvard was able to hand the Bulldogs their first Ancient Eight loss, and improve to second in the conference in the process. 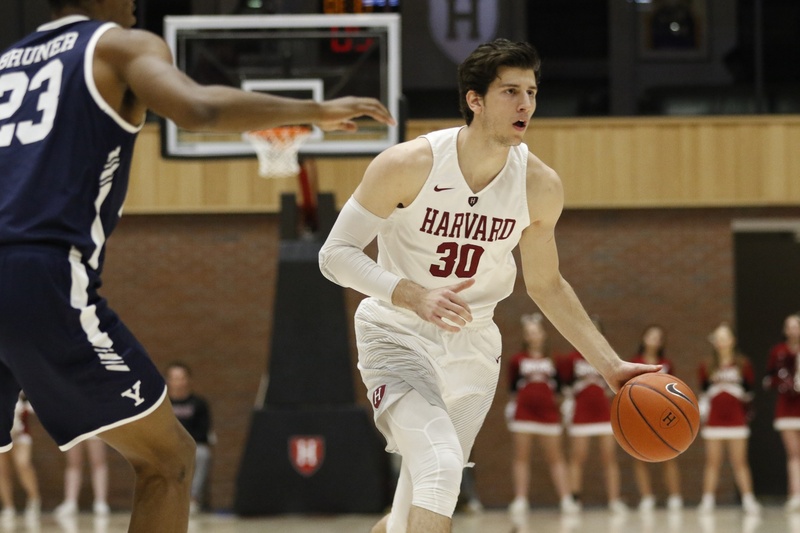 A “bench and balance” focused Harvard team relied upon its depth to help spell starters Bryce Aiken and Baker, both of whom played fewer than 24 minutes. By keeping both players relatively fresh, Coach Tommy Amaker can hope to complete the weekend sweep by defeating Brown tomorrow night. As Aiken and Baker sat frequently, sophomore Danilo Djuricic came off the bench to record one of his most impressive efforts of the season. Djuricic, who started in several games this season, contributed consistent energy and effort on the glass, garnering seven rebounds, four of which came on the offensive end of the floor. Djuricic finished with an impressive 12 points, knocking down both of his three-pointers, and playing a key role in expanding the the Crimson lead with several tip-ins and effort plays. The Brampton, Ontario., native’s hustle and commitment, despite not being in the starting lineup, is the type of contribution Harvard must rely upon to secure a conference title. Sophomore forward Danilo Djuricic tallied 12 points and seven boards off the bench. 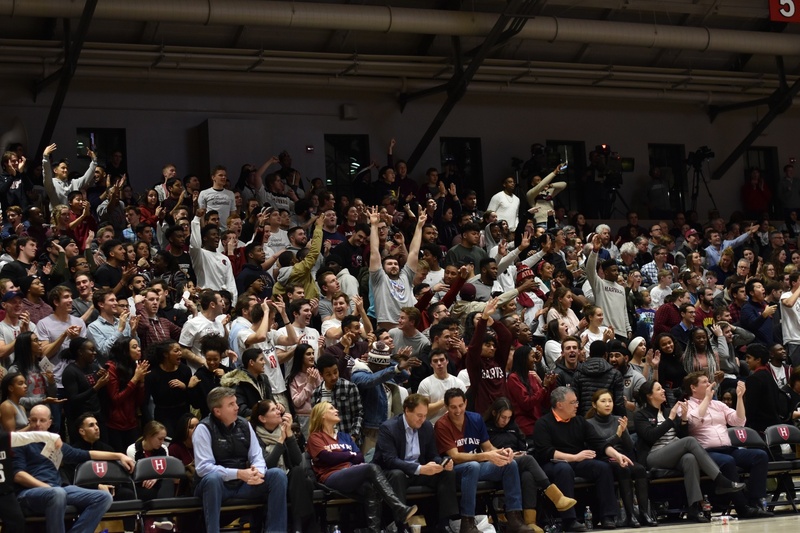 The Lavietes Pavilion crowd was on its feet for much of the game, as the Crimson’s ferocious defense limited Yale to just 4-of-23 from beyond the arc, and only 30 percent from the field for the game. With Oni struggling, the Bulldogs’ Alex Copeland lead the way with 14 points, but even he was visibly irritated by Harvard’s defense and the officiating, as teammates had to restrain Copeland after a questionable charge call. With each Yale foul, and mounting frustration, the volume within Lavietes only increased, as the crowd revelled in knocking the Bulldogs from their perch atop the Ivy League standings. This is the team's third sellout of the season. Student tickets sold out before the end of the first half. As Yale’s desperation heightened, the visitors employed a full-court press against the Crimson. Despite struggling earlier against the press against Mercer at Atlanta’s State Farm Arena, Harvard was able to weather the defensive pressure, in large part due to the steady ball-handling of guards Christian Juzang and Noah Kirkwood. As Aiken sat for much of the second half, Juzang played all 20 minutes, helping shepherd Harvard to the type of dominant victory that could help kick-start an Ancient Eight title bid. If the Crimson are to reach its first NCAA Tournament since 2015, it must rely upon the sturdy defense on display Friday night. 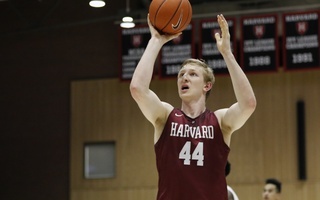 Since giving up over 80 points in an Ivy season-opening loss at Dartmouth, the defensive pressure exhibited by Harvard has been markedly improved. 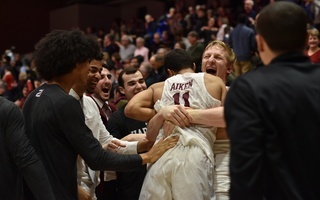 As the Crimson welcome Brown to Lavietes on Saturday night, Coach Amaker, and all in attendance Friday night, will undoubtedly feel more optimistic about this Harvard team’s prospects of a March run. If the Crimson can play with the same intensity and passion, with or without the Lavietes energy, an Ivy League Championship doesn’t seem so unlikely. With the return of Aiken and an energized defense, it’s easy to get carried away with postseason hopes and expectations. But in the heart of winter in Cambridge, for one night, it feels appropriate for Harvard to cherish the age-old satisfaction that comes from beating Yale - even as bigger tests loom on the horizon. — Staff writer Amir Mamdani can be reached at amir.mamdani@thecrimson.com.